The dual BA market is really starting to take off these days. I just got fresh off the FA DBA-02 MK2 review and along comes another similarly priced earphone with same dual BA qualities and in some respects very similar looking earphone. Truth be told this is the first time I managed to get a Jay for review despite their almost ubiquitous presence on the shelves of just about every mall I walk into so hats off to Jays Philippines for getting this out to me. Yeah it has been a busy month so this is going to be a fun listen with a cup of coffee. The Jays brand actually hails from Sweden and of late they have been hitting the market here pretty hard with some nifty looking earphone and small on ear headphone packages and have had some great critical success particularly with the V-jay’s on ear headphone which I rank right up there with the Aiaiai Tracks as some of the best bang for buck cans in the sub-$100 marketplace today. So Jays do have some pedigree for sure. Their their more budget line plus and 4’s are two earphones in particular that are taking center stage right now in the budget range. 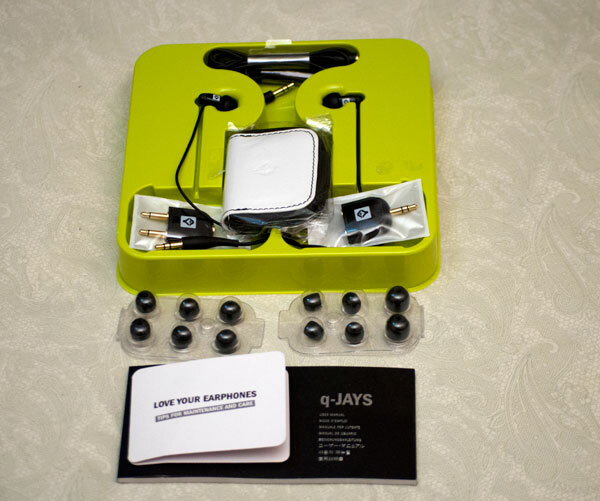 The q-jay’s are their upper tier earphone brand and sit well above the 4’s and the plus range and are being marketed as a ‘pro-range’ earphone. I have to admit the branding is pretty funky and they do seem to take the whole ‘package’ concept seriously since the q-jay comes in a larger than average box with more accessories packed in than a Swiss army knife has cutters. 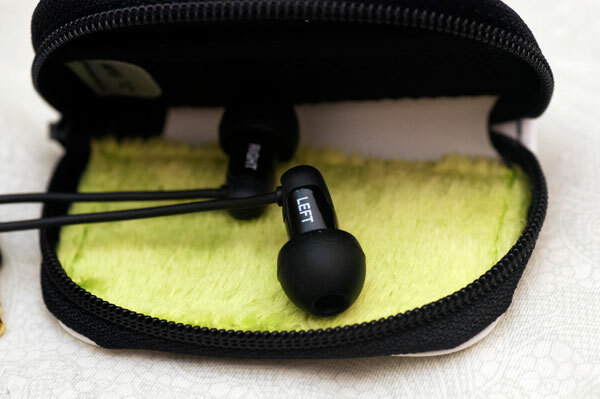 We have two blister type packs of 6 pairs of tips, a tiny little white zipper case, extension cable, an in-flight adapter and a special adapter to allow you to share the music with your buddies. That is plenty to get you up and running and kudos for the tiny zip case – I did not think the q-jays would fit easily into them but they did giving them a very low pocketable profile. The tips are standard rubber stuff though and I did have a tough time getting the perfect seal without a slight bit of discomfort for my ears. Of course everyone has different ears so I can only speak of my own experience but for me I think these will work better with a set of Comply’s or a hybrid tip rather than the more bulbous rubber stock tips. Compared with the slightly more varied range of the Westone’s or the Fischer Audio which has Comply and flange style tips I think this is an area worth considering if ever a revision comes out. Build wise these are among the smallest Dual BA I have ever come across. How they managed to fit the drivers into the tiny casing is magical and to be commended. Enclosed in a plain black casing shell and with non detachable cables they also come in white but with the same form factor throughout the range. Given the size they fit really comfortably in-ear and after a bit of tweaking the seal sets in giving pretty good isolation. Dual BA for me is now a ‘house sound’ of sorts with minor variations and the q-Jay’s are no different. Initially out of the box the trebles are a bit hot and a tad sibilant but after a few hours burn in the sibilance dies away giving very clean forward mids, articulate and balanced highs and a tight if not dominant bass. The bass from these little wonders really does depend on the seal you achieve. Move them out a bit and you loose it, get the right seal and its pretty satisfying. The bass extension is above average just dont expect them to give you a ton of impact. More of a coherent experience than a basshead’s dream. Experimenting with tips is going to adjust that clean sound to a warm sound especially with comply tips which for me provide the overall better musical experience. The overall tonality is a neutral and more towards the analytic than musical end of things but with excellent airy sound stage and instrument presentation. The q-jay’s analytical nature does often reveal a bit of grain with some bad recordings but throw on a bit of flac at the higher end and they do excel very well indeed. Out of a FiiO E9 3.5mm socket there was excellent noise suppression for me with above average black background reproduction. The mids are slightly forward in the presentation but very clean and detailed giving vocals a strong presence. Once you rid the initial sibilance out with about 50 hours plus your going to hear the strengths of the Dual BA design when it comes to vocal reproduction. The midrange itself is maybe not as meaty as some other competing dual BA but it does an excellent job in its own right and nothing is muddy or seemingly claustrophobic with most genres I threw at it. The highs are very articulate and detailed with plenty of snap and drive. Once it calms down the q-jays actually provide a very nice balanced treble sound overall and are slightly calmer and less fatiguing than the rather more feisty Fischer Audio DBA-02 MK2. I quite enjoyed the trebles with the q-Jay’s. Nothing seemed out of place and the balance was just right. Overall I quite enjoyed the Q-Jay’s balanced sound after the initial burn-in period. They are pretty versatile performers without any excessive sibilance or hot treble. A little light on impact but good extension on the bass and slightly forward mids are going to suit acoustic, jazz fans but the likes of dance lovers shouldn’t turn their noses up at the q-Jays also – they perform pretty well there also. Throw in a set of Comply tips and the seal and musical warmth goes up a few notches also which was very satisfying. Given their tonality, size and excellent packaging I would rate these higher than the Fischer Audio DBA-02 MK2 except for the stock tips and probably alongside the Westone UM3’s in terms of performance. They are also locally available as well which is a huge bonus! 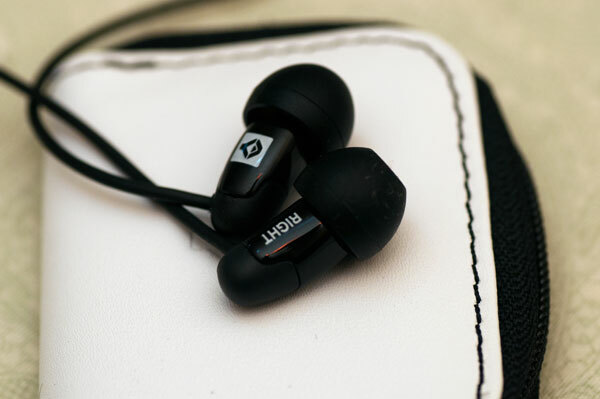 California Headphone Company Laredo–A Revolution in the Making?